Turn your bookcase into convenient end tab filing with the advantage of MAGNIfiles unique magnifying lens. 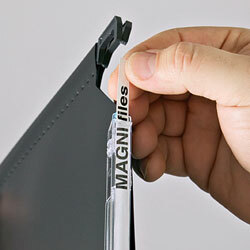 MAGNIfiles’ patented index lens doubles the print size of your file titles for fast identification. The lens allows for more detailed labeling, dramatically reducing retrieval time. 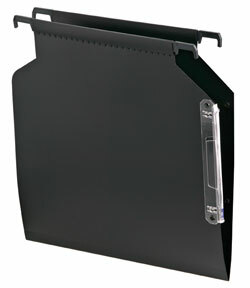 MAGNIfiles are the only hanging files that connect together accordion-style to prevent misfiled and lost papers between folders. Heavy-duty plastic supports glide effortlessly on easily installable rails that are available in two lengths to fit most standard bookshelves. MAGNIfiles are manufactured from heavy-duty, tear-proof polypropylene for a lifetime of reliable use. 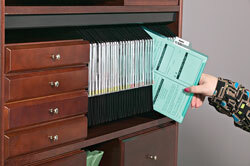 Choose from three folder capacities: V-bottom, 1/2" Box-Bottom or 1" Box-Bottom. All sold in sets of 25 with plain index strips.